It was a bit of a gamble when the Italian manufacturer released the latest-generation Multistrada; here was a company whose pedigree was racing and building superbikes now offering up a motorcycle that had comfort and real-world useability at the heart of its design. This was achieved through long-travel electronic suspension, relaxed riding ergonomics, and a torquey V-twin motor – all the while keeping to Ducati’s heritage of sporty performance. Visually, the motorcycle has changed very little since that 2010 release, but Ducati has trickled out updates over the years. In 2013, the firm’s semi-active Skyhook suspension debuted, before an extensive upgrade in 2015, the major additions being a revamped engine with variable valve timing, more electronic riding aids, a redesigned frame and cruise control. The engine has been beefed up to 1262cc, there’s a new chassis, updated Skyhook suspension and more modernised electronics. 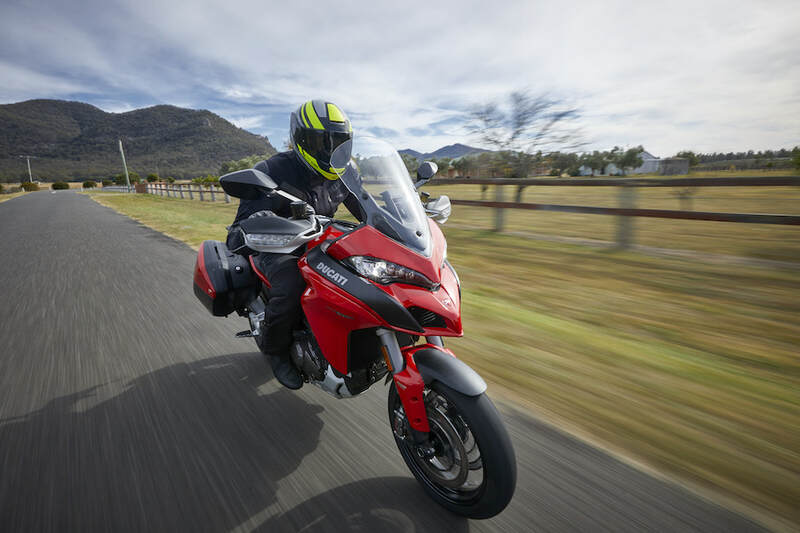 There are three models to choose from in the new Multistrada line-up, the base 1260 model ($24,990 +ORC), an up-spec 1260 S ($28,990 +ORC) and the range-topping Pikes Peak edition ($34,990 +ORC) that just won the 2018 Pikes Peak International Hill Climb. All three models house the same identical powertrain, but the base and Pikes Peak variants do away with the semi-active suspension and instead use fully adjustable Sachs and Öhlins units respectively – it’s a cost-saving measure on the base model and a weight-saving strategy on the proven race winner. The S and Pikes Peak editions share the same suite of electronics and full-colour TFT dash, while the base model loses some electronic perks such as the up-and-down quickshifter, the Multimedia system (it’s in there, just not activated) and it swaps out the TFT dash for a more conventional backlit unit. Our test bike is the 1260 S, whose biggest improvement is the adoption of the new 1262cc Testastretta DVT (Desmodromic Variable Timing) powerplant from the Ducati X-Diavel. While it may not be the same level of improvement that the 1200cc variable-valve timing engine was over the previous engine, it still offers a fundamentally better engine. 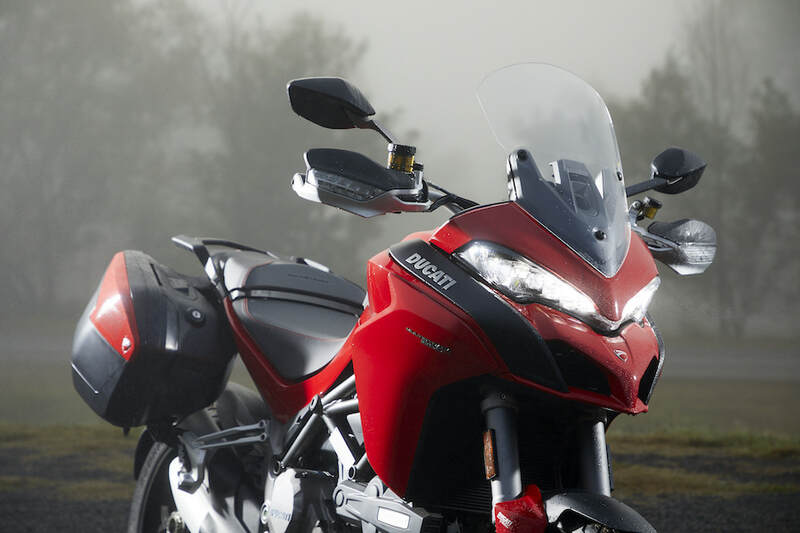 The first Multistrada engine loved to be ridden hard. Power was smooth and vigorous when revving north of 5000rpm, but below that it was cantankerous and often hard to get along with – not ideal on a touring motorcycle where plenty of time is spent at lower engine speeds. Ducati tried to smooth out power delivery on the previous engine, by reducing the valve overlap from 41° (which was used in the donor superbike engine) to just 11° – hence the Testastretta 11° moniker of the previous-generation engine. While this is a kick in the guts for one-upmanship, it’s great pub banter as the real talking point is its increase in mid-range torque output. Ducati reckons 85 per cent of the claimed peak of almost 130Nm is available from 3500rpm and there is now an 18 per cent boost at 5500rpm over the previous 1200cc powerplant. All this has been designed to make the bike more usable, where the majority of its time will likely be spent. All these figures can get a little confusing, but what doesn’t get confusing is how rideable this engine is in the real world. Twist the throttle and the engine responds with a continuous wave of linear torque; not only are the low-down vibes gone, but so is the torque drop at 5000rpm that the old DVT engine experienced. 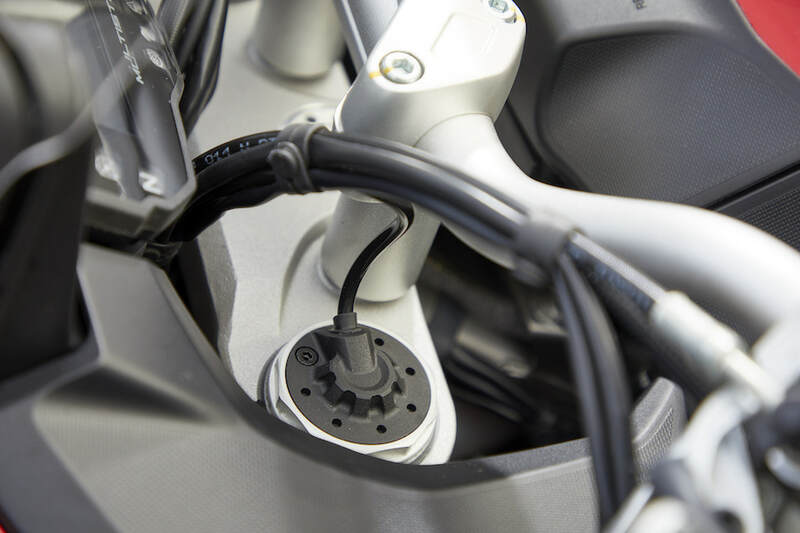 You can now labour the Multistrada in a gear too high without falling off the torque wave. And it’s an acceleration rush that pulls all the way to the soft-action rev-limiter. There are four riding modes that can be changed on the fly through the left-hand switchblock. 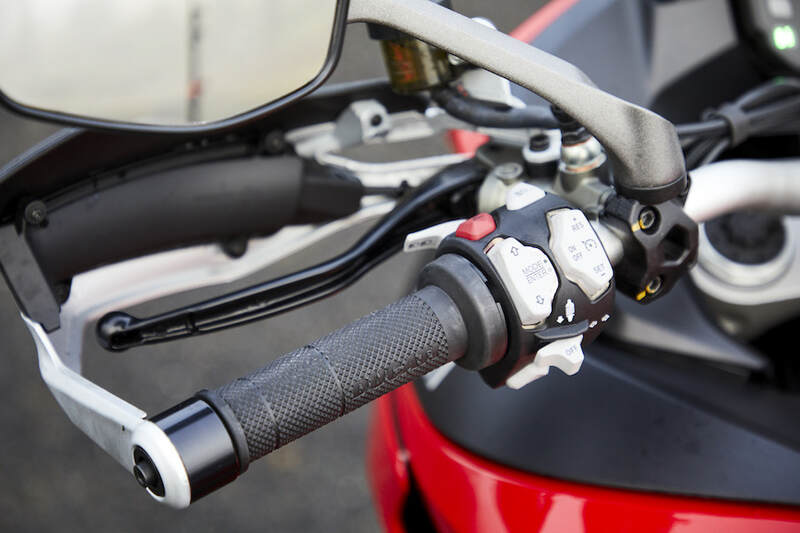 I was stoked when Ducati dropped the annoying combined blinker and engine-mode button – as I would always find myself in the mode-change option after cancelling the blinker. Sport mode feeds you the full 158hp, with the most direct throttle response, the least electronic intervention, and suspension programmed for fast riding. Throttle response is very direct but not snatchy, thanks to the variable-valve timing. Power builds strongly, while the suspension stiffens to cope with the increased speeds and more aggressive braking. Touring mode still offers you full power, but with a slightly duller throttle response and a more gradual production of power. Traction control, wheelie control and ABS are all heightened, while the semi-active suspension softens to handle the majority of poor roads in Australia. In my opinion Touring is the best mode for the Multistrada and was the one I most often found myself using because it allowed me to push harder and safer in the real world. Urban mode cuts power down to 75kW (100hp) and further increases the sensitivity of the electronic riding aids. This decrease in power allows you to dice in and out of traffic easier, and the increase in electronic intervention is a welcome addition when negotiating slippery city roads or wet backroads. Enduro mode is the final mode; it retains the 75kW power output of Urban but switches to off-road-appropriate suspension settings, and ABS on the rear wheel is disabled. If you cant help but fiddle, all these pre-set riding modes can be customised to your liking. For example, if you think you’d prefer all 158 horses as you’re belting along a twin-track dirt road, then go right ahead – you really can change any setting you want. All the riding-aids are controlled by an inertial measurement unit (IMU), which constantly measures roll, yaw and pitch. This unit then sends commands to the ABS to control lock-ups while leaned over, the wheelie control, the semi-active suspension, and even the dynamic cornering lights fitted on the S model. 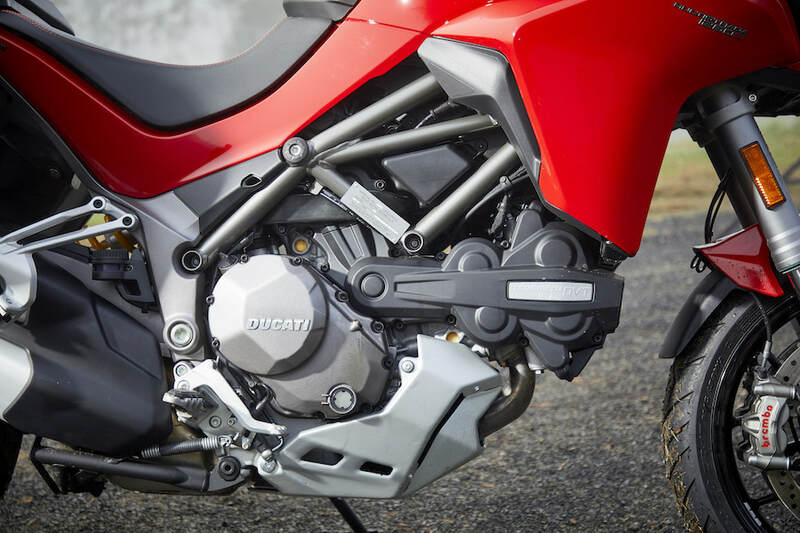 And, thankfully, Ducati has finally fitted a bi-directional quickshifter – a major oversight on its previous Multistrada offerings. Thanks to the engine being so tractable, gear-changes are minimised, but when the next gear is called up it slides into the adjoining gear effortlessly – be it a cog above or below. There’s nothing better than a smooth quickshifter that’s effective even at low revs with small throttle openings – two aspects that will instantly reveal a pitfall in a quickshifter. But you do have to be assertive with your foot; I found that a light tap can sometimes result in a false neutral. 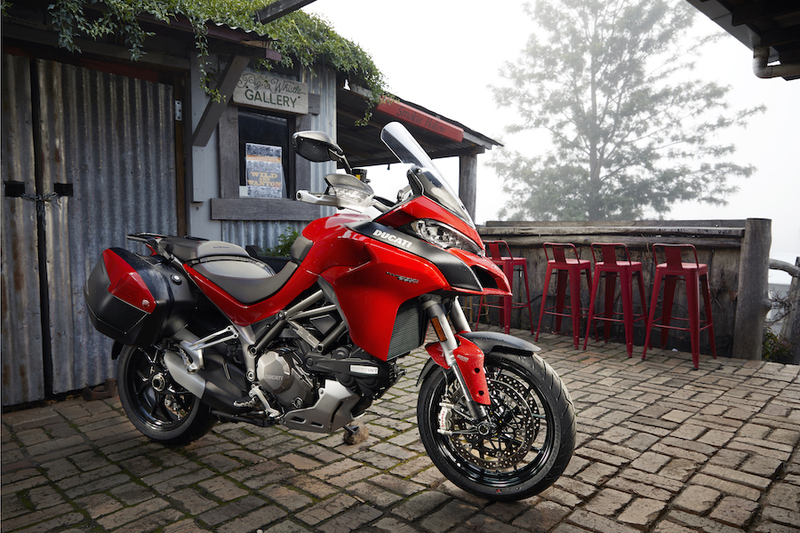 The updated chassis now features a 48mm-longer swingarm, and increased trail and rake, which combine to increase the Multistrada’s wheelbase to 1585mm (up from 1529mm). Ducati chose to do this to improve high-speed stability, especially with panniers, a passenger or both. 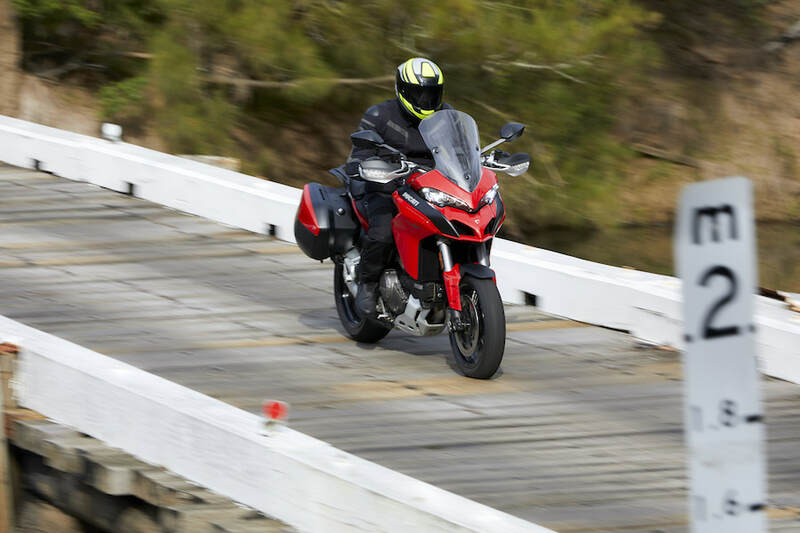 The Multistrada’s agility has definitely slowed a little compared to the previous model, and turning does take slightly more effort, but this is far from being a deal-breaker. Tip-in is still accurate and front-end feel still exceptional, and the increased stability allows this model to hold an improved line compared to the older model. I found the previous Multistrada liked to stand up during a turn unless inside bar-pressure was maintained – but that’s not the case with this model. Once in the turn, it stays there. Coupled with the wide handlebar for leverage and longer travel suspension to soak up any inconsistencies, there wouldn’t be many bikes you could punt along as fast as this on the average Australian road. The Skyhook semi-active suspension changes its pre-sets as you cycle through the riding modes, but like most options on this motorcycle, everything is customisable. Through the left-hand switchblock you have the option of running any combination you desire. It also has the option of quickly allowing you to change between single rider, rider with panniers and adding a passenger to both options. 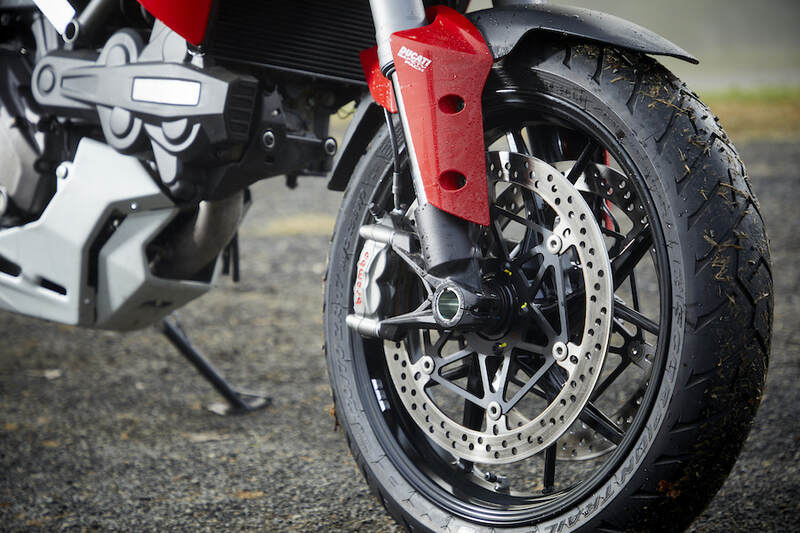 A Brembo braking package works in unison with the Bosch 9.1ME Cornering ABS ECU to adjust the ABS intervention depending on your lean angle. The front brake lever offers a good and progressive feel, with more than enough retardation when called on in any situation – even an emergency. In terms of comfort, the Multistrada makes those really long days in the saddle quite enjoyable instead of a chore. 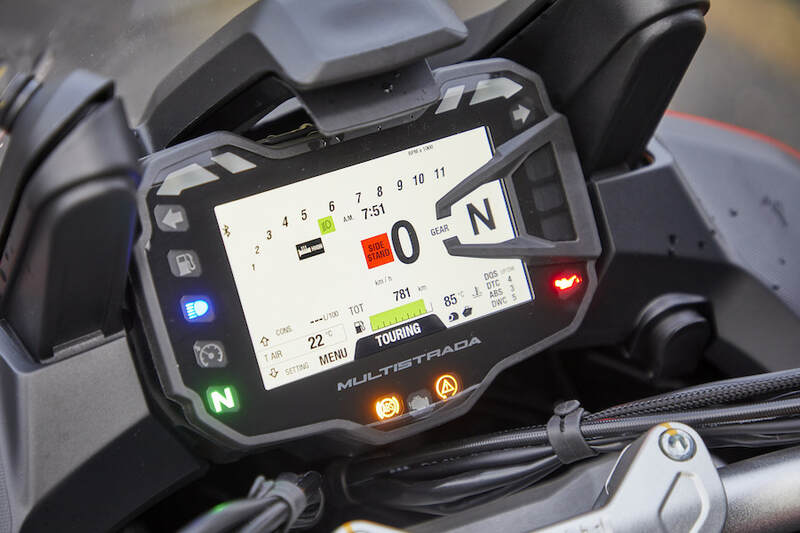 The electronic cruise control is a must-have for a touring motorcycle, and this one features speed increments and a resume function. The hand guards offer wind protection, and the three-level heated handgrips mean you get warmth, but I reckon they could have been warmer – even on the highest setting. 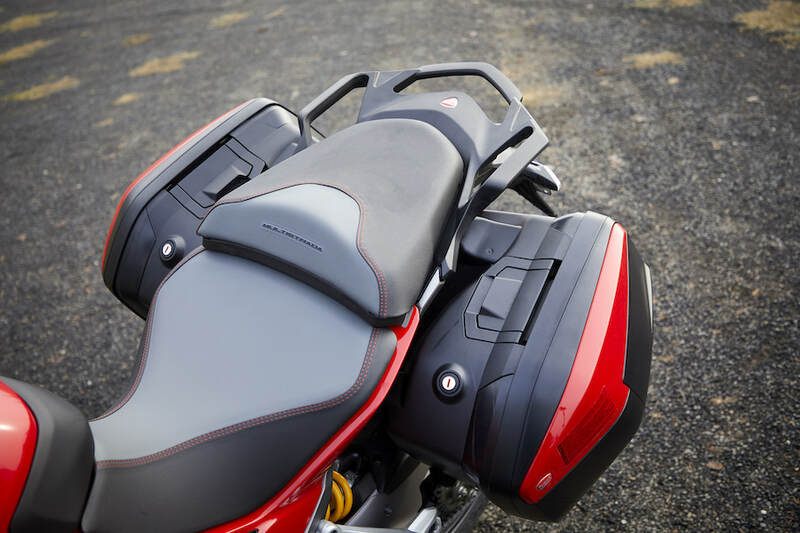 The seat height is adjustable to help with shorter riders, and the seat offers an abundance of room for a pillion. After many kilometres of two-up riding I didn’t receive any complaints from behind. The large rear grab rail is also a bonus for the pillion and, with the panniers fitted, allows the passenger to really lock their legs in. 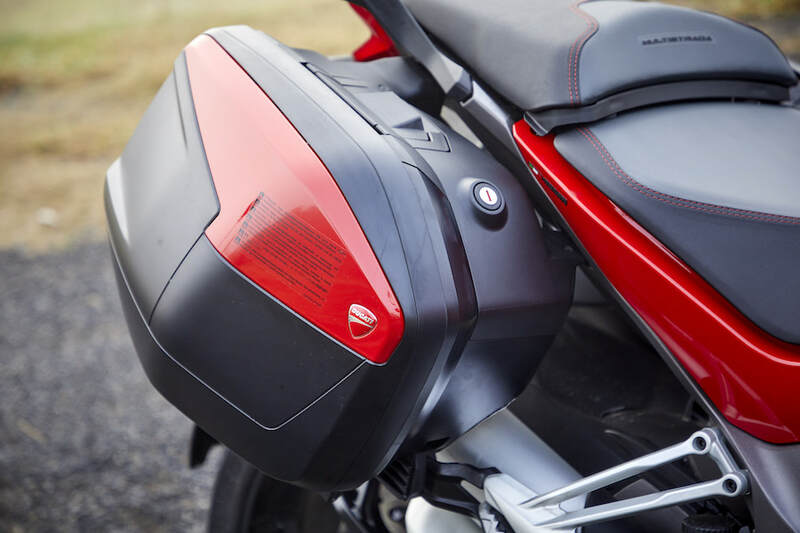 The panniers are quite large, though the exhaust-side one is slightly smaller, and they feature rubber seals to keep the water out, as well as an elastic belt to keep everything in place. They’re easy to fit, but you can’t leave them unlocked – instead having to use the key every time you need to access them, which is annoying on a motorcycle boasting a keyless ignition. And I would have also liked a keyless fuel cap, allowing the key to remain in my pocket for the entire ride. The adjustable windscreen offers adequate weather protection and can be easily adjusted on the fly. With my tall frame, I noticed a lot of buffeting regardless of the height I had it set at – maybe a bigger aftermarket screen would fix this. The extremely bright full-colour TFT dash is easy to read and offers a plethora of information. The dash layout also changes depending which mode you’re riding in, and the gear indicator has a plastic border around it that helps guide your eyes to it for a quick glance. Ducati has made this dash more user-friendly, doing away with the previous complicated options. For example, now when you change suspension settings you see words like ‘soft’ and ‘hardest’, while engine modes have words like ‘reduced power’ and traction control ‘safe/stable’. This, compared to technical jargon and numbers, offers confidence to fiddle and provides a clearer idea of what to expect. The ‘S’ model features the bluetooth activated Ducati Multimedia System (DMS), which allows you to connect your smartphone to the dash and receive text messages, make calls and play music through handlebar controls. It can also upload to your phone parameters such as lean angle, maximum speed and much more, which enables you to track your rides, compare routes, see what other people are doing and to complete goals in the rewards section. 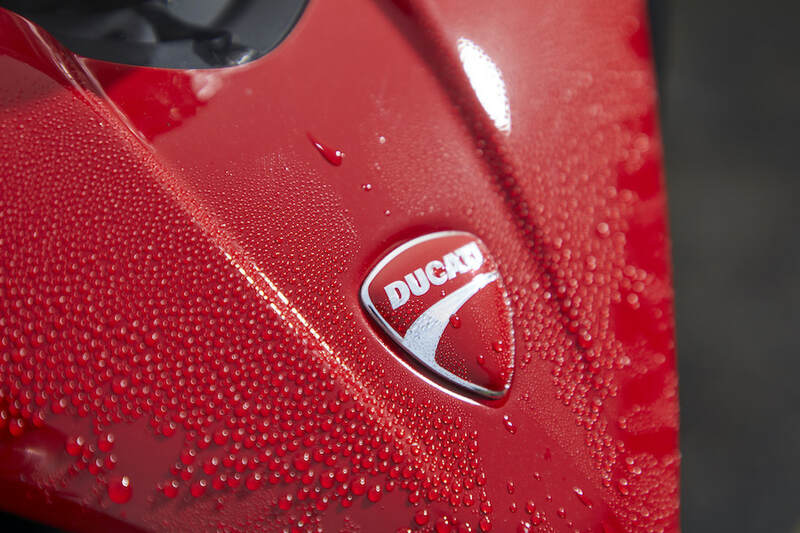 One thing that customers have been cautious about with Ducatis is their regular service requirements, but the Multistrada 1260 benefits from long maintenance intervals that see an oil change required every 15,000km and a major service only every 30,000km. Ducati already had a winner with its first Multistrada back in 2010, but has constantly pushed its development to produce a near-perfect evolution capable of taking on a throng of new rivals. The engineers have again improved on a tried-and-tested base and again raised the benchmark of what a dual-sport model needs to be able to do to cut it in this segment. The new 1262cc variable-valve-timing engine, coupled with comfortable ergonomics, advanced rider aids, touring capabilities and sportsbike potential, means this is again not only my favourite Ducati, but could quite possibly be the best do-it-all motorcycle currently on sale.